Uh-oh! There's big trouble in Candy Land! The king of all candy has been kidnapped and imprisoned in the palace dungeon. No more sweets unless you can help rescue him and save Candy Land -- to do so, you'll have to use your wits, explore six "tasty" lands and defeat the evil Lord Licorice. Targeted at the three-to-six age level, Candy Land Adventure by Hasbro Interactive brings the popular children's board game, Candy Land, to the computer screen with colorful graphics, interactive gameplay and a musical background. Two children can play simultaneously in a "team" mode where they take turns and work together to rescue King Kandy. The game provides both an easy and hard level of play allowing for some adjustment to each child's skills. 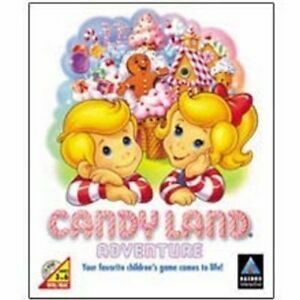 In this animated adventure, you can visit six distinct lands in order to collect six pieces of candy -- either one from each, six from just one land or any combination of lands you choose. During your adventures, you can explore the Peppermint Forest and find all the hidden animals to earn a peppermint candy cane, the Gingerbread Orchard to collect plums and keep the gummy worms from eating them and Lollipop Woods, making a staircase out of lollipops of varying heights -- reward, a "luckipop." Further adventures await at Gumdrop Mountain where a rock candy slide has buried miner Jolly. 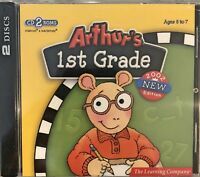 You must drag the rock candies off him and put them in alphabetical order; once done with that task, you'll drop into the Gumdrop Mines and find a letter-matching game. At Peanut Brittle House, you'll have to clean up scattered candies caused by a cotton candy tornado and put the different shaped candies into their proper holes. In the Ice Cream Sea, your task is to restore color to the sea by clicking on various colors from a palette at the bottom of the screen and applying them to the drawn picture on the screen. Headquarters for all the activity in the game is Lord Licorice's palace located in the Molasses Swamp. Once all six candies have been collected and fed to Gloppy, entry to the palace dungeon, where you find the imprisoned King Kandy, is provided. Candy-filled treasure chests and animated good-byes by the many characters in the game reward the successful adventurer. Candy Land Adventure focuses on the skills of memory and matching, counting, size and shape sorting, painting, cooperative play and letter sequencing. The interface is point-and-click. I bought this game for my niece's 4 year old daughter. She has very little computer experience. My niece showed her once how to work the games. She loves the games and plays it at lease once a day with no help. Grand kids love it. I had one that wasn't working well. Problems booting up and two player function didn't work. The one I just bought had the same problems. One person plays, but takes several tries to boot both up.